Frankfurt 2009: Peugeot 3008 | What Car? The 3008 is Peugeots answer to rugged-looking family hatchbacks like the Nissan Qashqai. When get I can one? Of course not! While weve seen the 3008 before, invited What Car? readers to a special preview of the car and driven it to Frankfurt, its the hybrid version of the car thats the big news at the show. 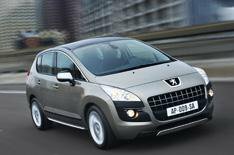 On sale in spring 2011, the 3008 Hybrid4 will be Peugeots first hybrid, matching the most powerful 163bhp 2.0-litre diesel from the rest of the range with a battery-powered 37bhp electric motor. The result, says Peugeot, is fast performance with emissions of 99g/km - 74g/km less than the standard 2.0-litre diesel, which is low enough to get into the satisfying 0 vehicle excise duty band. The car had originally been pegged at 109g/km and 68.9mpg, but refinement of the system has lowered emissions and brought the promise of more than 70mpg on the official combined cycle. An efficient, electronically controlled six-speed manual gearbox helps to keep fuel consumption and emissions down, while the car is also fitted with a start-stop system. Whats the four in Hybrid4 all about? Well the engine drives the front wheels, as usual, while the electric motor does its business at the other end.